The following article on running a successful parish appeal is part four of the Almoner’s blog, a series of fictional letters from a parishioner to his parish priest about fundraising. So I came out to my truck this morning and found that I had a flat tire. What does this have to do with fundraising? I’ll tell you. 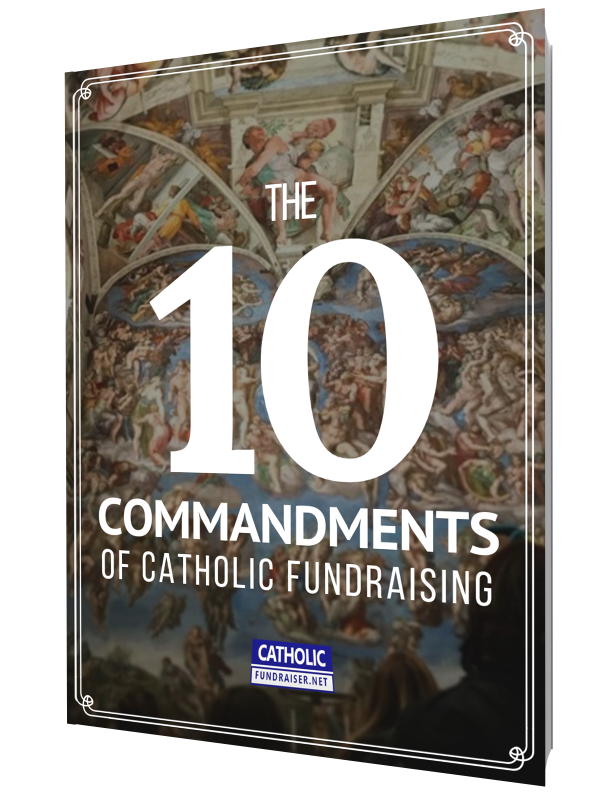 The other day, I read a great article by a Catholic priest on the topic of fundraising. He explained how he increased his offertory by 30% without even asking. It was the same feeling I had when I found my truck with a flat tire: dumbstruck. Here I am, telling you that fundraising REQUIRES asking, and here he is describing how he succeeded without doing so. I looked at the article with the same expression as I looked at my flat tire. So what is going on here? I had been thinking about this article for a couple of days, trying to understand how Fr. Alan’s success fits in with my knowledge of fundraising. Then it hit me: he was closing the loop on his parish appeal. So far, I’ve mostly written about the ‘asking’ part of fundraising. I focus on this because it’s the hardest part to do correct and the easiest part to do wrong, but asking is just the beginning. Great fundraising focuses on fostering relationships with your donors. What you said you were going to do, you go out and accomplish it. You also communicate to everyone, not just donors, what you are achieving. It’s always important to communicate what you have accomplished with your donors. Take the necessary time to stop and enjoy the fruits of everyone’s labor. I think a lot of donors feel perpetually inside the first part of the lifecycle, always being asked for money. Their donations then get sucked into a black hole, never to be seen again, as they are never thanked properly. Instead, it’s back to being asked again. Also, when starting a fundraising campaign or appeal, you don’t have to start with the ask. Like Fr Alan, he began with step number four, ‘doing’. This provided momentum to accomplish the other steps. Even after being thanked, donors want to know how their donation did something productive. It’s important to recognize that behind each donation is a person, a story and hard work. It’s never just a monetary transaction. When you complete the lifecycle by communicating and celebrating the outcomes and successes, people get excited about giving again because they know that their gift has made an impact. They also learn that another one will do the same. Fr. Alan realised this. He decided not to ask for more money because it was not the right time in his parish to do so. This wasn’t where everyone was in the life cycle. Instead, he worked to tighten the belt financially, did some inexpensive but greatly needed physical upkeep and communicated to his parishioners what he was trying to do and where they were succeeding. By focusing on the DOING of being a good steward, he was enabling his parish to CELEBRATE how the church that was more attractive, better managed, and better maintained. The visual cue of newly painted walls helped the parishioners see how their gifts made an impact. As a result, they were willing to increase their gifts because they wanted to see more. There is an ASK in the bASKet! I do have to disagree slightly with Father on one minor point. It’s not true that he didn’t ask. During every Mass, there is an ask, even if nobody likes to talk about it. After the homily, when the ushers pass the baskets through the pews, that is an ask. It is a gentle one, but I know from my personal experience that I feel it, especially if there is nothing in my wallet. By sharing the results of good stewardship, Fr. Alan improved the success of the bASKet: a 30% increase is extraordinary. He also runs a better parish appeal. I celebrate his tremendous accomplishment and rejoice that his parish responded so well to his loving attention. When he completed the life cycle and allowed parishioners to celebrate successful stewardship, the fundraising cycle started afresh and brought in more money. So, I think I have plucked this particular thorn out my understanding of fundraising and a parish appeal. Now, I have to get the nail out of my tire. Nathan Krupa writes about fundraising at https://thealmoner.com. He lives in Augusta, Georgia with his wife Mary and two sons, David and Joseph. He has raised money by writing grants for Golden Harvest Food Bank (www.goldenharvest.org) for five years, and is a member of the Parish Council at St. Joseph’s Catholic Church. He is also a member of the Alleluia Community, an ecumenical covenant community. He writes a collection of letters called ‘The Almoner’s Blog’. In the old days, the almoner was the office in the church that asked for money to support charitable work with the poor. Discussion Question: Which part of the cycle have you found most important? Also, if you like what you read, please click the share buttons to tell others. Thank you.